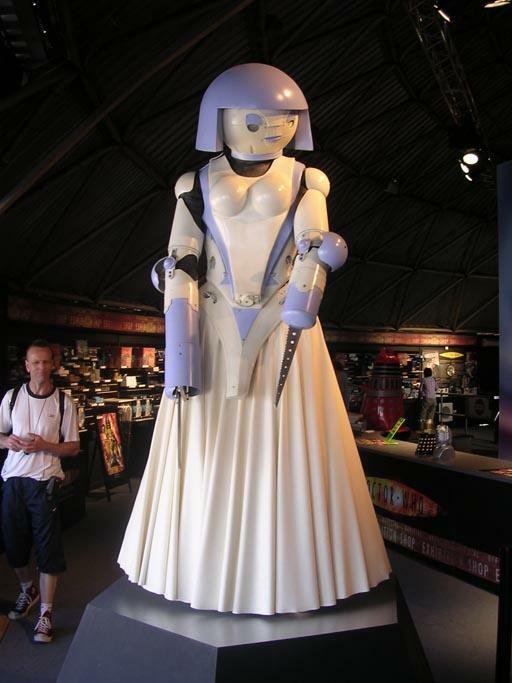 The new BBC Doctor Who exhibition in Brighton, which opened on the 14 May 2005, is an impressive affair. It's sited at the end of the main Brighton Pier in a large domed building. The work that has gone into it is amazing - and more impressive is the publicity. As we were driving into Brighton, one of the roads was adorned all the way along with banners on every streetlight promoting the exhibition. Then, on the pier itself are many more banners each showing different elements from the exhbition. 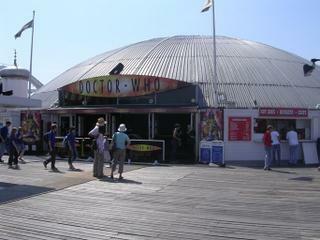 At the entrance to the pier itself there's a Police Box and large advert for it as well. It's hard to miss that the Doctor is in town. The exhibition itself has a separate ticket booth, but once tickets are bought, you move into the main dome. First up are the two makeover androids from 'Bad Wolf'. These are even more impressive in real life, and the attention to detail is astounding. Moving around them, and there's a small tribute to the first 42 years of the show's history, with booths containing information on the Doctors and some of their foes. There are also some original costumes sited behind the displays which are quite hard to see. Then it's into a main area where a large TARDIS is revolving sedately in the centre, two sides showing as Police Box and the other two cut away to reveal the original costumes for Christopher Eccleston and Billie Piper. Around this area are large murals of pictures and information about the show. There's some panels from the TARDIS interior and an original design model as well. 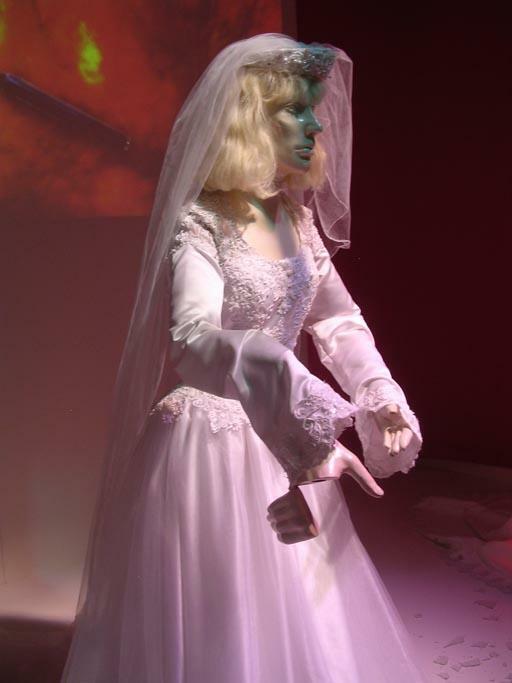 Around the corner and we're into 'Rose' with an Auton model perched up high ... a wheelie bin and three Auton Brides crashing through a shop window. Then it's to 'The Unquiet Dead' and an area with a mysterious shrouded figure on a slab ... all the displays have audio/visuals and clips from the shows playing on screens. 'The Unquiet Dead' area is good, but a little uneventful. It's a shame that more costumes weren't on display here, or Sneed's cart and so on. It's good, but perhaps a little bare. I think I might have tried for a dingy, small corridor here, with flickering 'gas' lights along the sides and spooky funereal music playing, and then projected a Gelth onto the walls and made it flicker from 'good' blue to 'bad' red ... Around the corner and it's 'The End of the World'. Unfortunately both Cassandra and The Face of Boe were away when we visited, but it was nice to see the Moxx, costumes for the Trees and several props from the story. 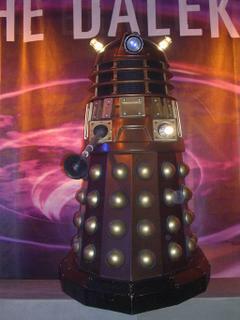 Next up is the Dalek! Hovering on a flight of stairs, the creature will turn it's eye to look at you when a button is pressed ... nice idea. 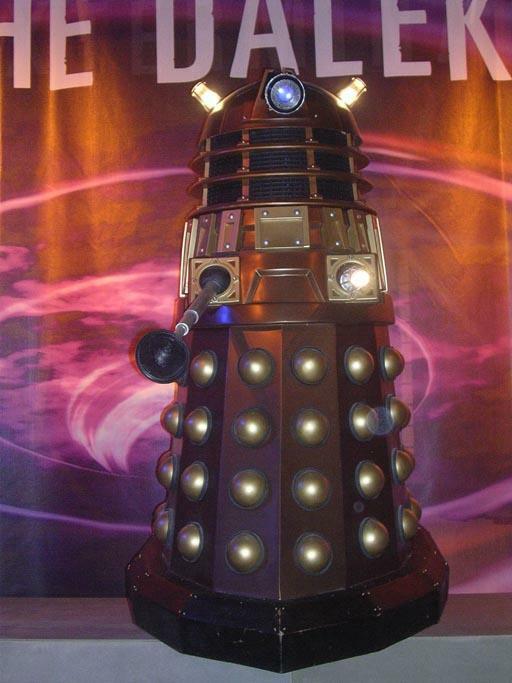 Also here was the Emperor Dalek model from 'The Parting of the Ways' and lots of other bits and pieces besides, like the alien musical instrument. Around the corner again and we have the magnificent model of the Big Ben clocktower, all smashed in, and then the Slitheen, the alien pig and Margaret Blaine's skin ... The Slitheen can be made to fart on cue with a button ... Finally, we have a small display from 'The Empty Child' of a gas mask and the Schlecter Bomb ... again, slightly disappointing. Overall it's a superb exhibition, full of lights and sound and lots and lots to see. I'm told that more items are to be added as the year progresses, and I hope that some of the episodes without much presence at the moment will be represented, like 'The Long Game' or 'Father's Day'. Just before you exit the exhibition tent, there is a shop area selling piles of merchandise, including a load of items especially created for the exhibition, like CD cases, mini-tool sets, clocks, calculators, a mousemat, pens and other things. Other things I liked: the 'Bad Wolf' graffiti on the way out (but why wasn't it elsewhere in the exhibition ... they could run a 'hunt the Bad Wolf' competition to find all the references); the Dalek shell with the creature inside from 'Dalek'; Mickey's disembodied Auton head; and the fact that the place was packed - it was an incredibly hot Sunday afternoon that we went down, and the pier was heaving with people ... and there was no air conditioning in the Doctor Who area so air blowers had been set up. Everyone seemed to be enjoying themselves though. Outside the Exhibition, and back towards the entrance to the pier is a pub selling the most amazing chips and sausage (and beer and wine and coke) and the prices aren't too bad as well ... so it's well worth stopping off there for some good old fashioned English grub. 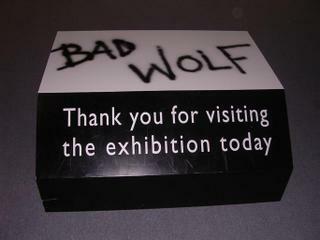 Visited the Exhibition the other day David and, to be honest, I was a bit disappointed. Nothing has been added since you visited 6 weeks ago, and I thought that for £6 adults and £4 kids it was overpriced. FWIW, the actual location used to be a slot machine arcade. I'm told that the plan has always been for it to run just for this year, but that the closing date has been extended from October to November. As ever, time will tell! Comparing Brighton to the Blackpool exhibition, I must say, the Brighton exhibit, even though it focuses more on the new series, it is rather a letdown compared to the Blackpool exhibition. £6 for adults at each exhibition. Blackpool exhibition IS worth the 6 pounds as it is very vast, has a section of the new series, and so many things from the classic series. And at the Blackpool shop you can find a HUGE majority of things to buy..whereas in Brighton it's the same items over and over again. Not saying Brighton exhibit isn't good, but after seeing both exhibits, I think you'd get your money's worth at Blakpool and wouldn't be disappointed.